Hockey Mom Knits: Easy Lace Stashbuster Scarf! I'm getting a birthday bouquet for Grandma, sent to her from http://yarngiftbouquets.com/. Roxanne and I are taking one of the sock kits and turning it into a scarf kit. Grandma knits but hasn't picked up the needles in awhile. And what do you get someone who's turning 80 and has everything. Some gorgeous yarn and needles, oh yeah. But we need a pattern for a really simple scarf. I always liked this pattern and I have no clue where it came from. I believe it came from a stitch guide. It is so simple and once you get the hang of it you don't need a hard copy. So I have used it for years to use up those pesky part balls of yarn in my stash. Sometimes long ones, sometimes a neckwarmer scarf to tuck in your coat. Yarn - anything you have (this was a fuzzy sport weight acrylic in my stash) less than 200 yards. Knit 6 rows garter stitch for bottom border. Row 4 - K3, purl to last 3 stitches, K3. Repeat rows 1 - 4 until scarf is as long as you like or you run out of yarn. But leave yourself enough to finish another border. Knit 6 rows garter stitch for top border. This pattern can be varied by size of yarn, size of needle and number of stitches. It is a multiple of 2 stitches so you can make it as wide as you want. Anything you want. Gets rid of those part balls of yarn in your stash. Came here from Ravelry -- love this pattern! also came here from Ravelry - you solved a last-minute gift requirement for me - thanks! Also, this is a great stash-buster... I am eager to try it with different yarns and needles. oh, yeah... forgot to say "Thanks!!" What a great pattern! 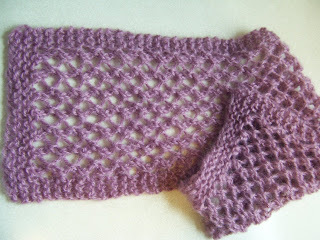 And a great introduction to 'lace' knitting! My mother had just written down on a piece of paper last year... this makes for a beautiful scarf... and keeps us hockey moms busy during the long hours at the arena... easy pattern that can be done still while watching hockey practice and chatting with other parents. I loved this pattern and made two scarves with it... does anyone else notice that the scarf curls up though? I found this pattern from Ravelry, and it's just perfect! I have some fun fluffy yarn and I'm using size 15 needles. So far this scarf is awesome, and I think it's going to turn out amazing! Thanks for the pattern! Came here from Ravelry. Thanks for the pattern. You make my day!